Please write “DALE & CHERYL RAMSEY” on the check memo line or in the memo or account field in your online bill payer. Because Cheryl’s parents were missionaries, she spent her formative years in Nigeria, Canada, and the US before completing her schooling at Calvin College and Fuller Graduate School of Intercultural Studies. In 1994 she began serving in Guinea, West Africa, among the Muslim Fulbe/Fulani people, where she was involved in relational evangelism, discipleship, literacy, and translation editing. 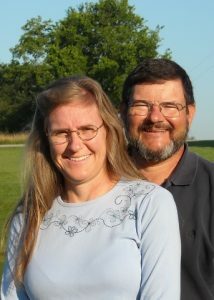 Dale grew up in Cincinnati and southeastern Indiana in a non-Christian home and came to Christ in his early 20’s. While attending his first missions conference, he was struck by the overwhelming needs for laborers, and his own availability. While pursuing Biblical and missiological training at Columbia International University, Dale sensed the call to missions and a burden for Muslims. In 1990, he began serving as a church planter among the Muslim Maninka people in Guinea. Despite the great distance between where they served, Dale and Cheryl began courting in 2008 and married the following year. Shortly afterward, they settled in a small town in a region where both Maninka and Fulbe people were found. From this base, they traveled to village markets, selling scripture portions and cassette recordings. In the spring of 2013 they relocated to the States to become part of IFI’s outreach in Cincinnati, Ohio. After living and serving in Guinea as “visitors” among Muslim tribal groups for most of their adult lives, they’ve had to adjust to life in America serving Internationals here, trusting that they can relate well to those who live as visitors in another country. They would appreciate prayer for grace and enabling in this strategic ministry and look to God for provision to minister full time.